Mary Stuart, Queen of Scots receiving her death warrant. Home » Mary Stuart, Queen of Scots receiving her death warrant. Mary Stuart, Queen of Scots 1542-1587. 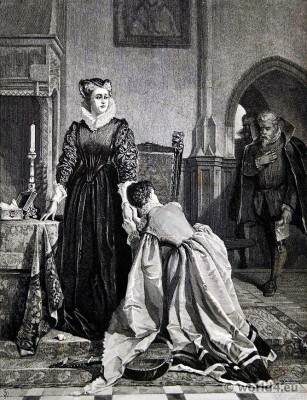 Mary Stuart receiving her death warrant after she was found guilty of plotting to assassinate Queen Elizabeth I of England by James David Smillie (1833-1909). English Tudor fashion in the XVI. Century. French lady at the court of Marie Stuart 1560. This entry was posted in 1587, 16th Century, England, Nobility, Renaissance, Tudor and tagged Renaissance fashion era, Tudor period on 11/6/14 by world4.